Scooper - Technology News: The economy and prescription painkillers: A deadly combination? The economy and prescription painkillers: A deadly combination? About 15 years ago, death rates among middle-aged white Americans stopped falling and started to climb. It was an unprecedented reversal for a modern industrialized country, and we still don’t fully understand why it happened. The researchers who sounded the alarm — Princeton economists Anne Case and Angus Deaton — pointed to rising rates of suicide, drug overdose and alcoholism as possible clues. These so-called diseases of despair can’t fully explain why the death rate has stopped improving, but they do hint at an underlying cause: a growing sense of overall malaise about their lives. “Whatever it is these people are unhappy, they're left behind, some of their jobs have gone away, they're worse off than their parents were, they're worried about opportunities for their kids,” Deaton told Business Insider at the World Economic Forum in January. Recent research has illuminated an aspect of this puzzle: the connection between economic distress and certain kinds of self-destructive health behaviors. It’s well-known that deaths from opioid overdoses, which quadrupled among white people since 1999, have become a crisis in their own right. The rise of prescription painkillers enabled the opioid epidemic, but the economy may have also played a role, according to a new study from economists at Indiana University and the University of Virginia. In a draft of their research released Monday , Alex Hollingsworth, Christopher J. Ruhm and Kosali Simon find that rates of opioid deaths grew faster in countries where the unemployment rate climbed faster than average. They analyzed health records from 1999 to 2014, comparing how overdose rates changed in places where the unemployment rate ticked upward unexpectedly, and places where it ticked downward unexpectedly. Because of the way the study was designed, it couldn’t measure the overall effect of national changes in the economy, like the Great Recession and the subsequent recovery. Instead, the research tells us that places that weathered the Great Recession more gracefully were better able to resist the opioid epidemic, while places that suffered during the Great Recession were harder hit by opioid deaths. This is more surprising than it seems. As Ruhm points out, alcohol use actually behaves the opposite way. People tend to buy less alcohol in bad times, and more alcohol in good times. In fact, there’s a well-documented correlation between economic growth and higher death rates. When the economy is booming, people tend to behave in more risky ways, and pollution also increases. When the economy is in recession, both those risk factors abate. Ruhm was one of the first to point out this relationship back in 2000. But in the United States, at least, it seems recessions are no longer saving as many lives as in the past. Ruhm and his colleagues believe the explanation might lie in the rising incidence of opioid addiction and suicide, which both tend to spike during stressful times. And, while overall alcohol use doesn’t increase during an economic downturn, researchers have found that people are more likely to engage in binge drinking. Another piece of evidence for this view comes from economists Justin Pierce of the Federal Reserve Board and Peter Schott of Yale. In a November working paper, these researchers analyzed the health consequences of the increased trade with China in the early 2000s. In places where trade caused unemployment to spike, the researchers found higher rates of death by suicide and drug overdose — mostly among whites, and particularly white men. Meanwhile, the rate of fatal heart attacks actually decreased in places with more unemployment, a pattern that has also been observed in other countries. Researchers believe that unemployment, even if it is more psychologically stressful, is at least not as taxing on the heart. Clarifying these kinds of connections — between physical, mental, and economic well-being — will be important because they will guide the actions that doctors and politicians will take. The underlying forces driving people to dangerous behaviors in the first place need further examination, these researchers say. Consider the now well-known chart from Case and Deaton’s paper on middle-aged white mortality. The red line represents Americans. Added together, the increases in deaths from drug overdoses, suicides, and chronic alcoholism are just about enough to explain why the death rate increased from about 400 to 430 deaths per 100,000 people. But meanwhile, in countries such as France, Germany and the United Kingdom, the death rate has been declining. 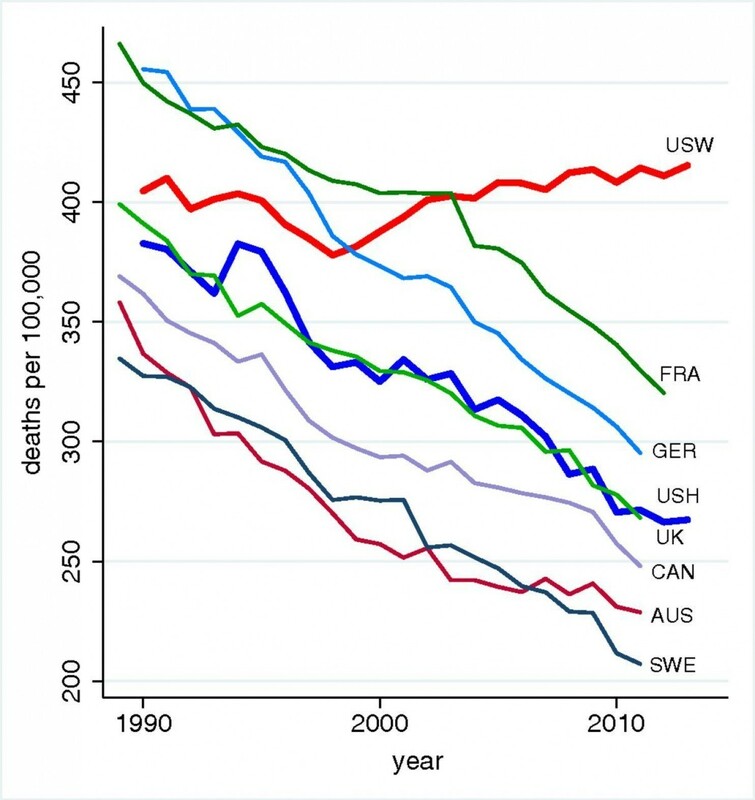 Back in the early 1990s, middle-aged people in the United States and the U.K. had similar death rates. Now, middle-aged Americans are 50 percent more likely to die than their U.K. counterparts. This doesn't have to do with drugs at all — in both countries, cancer and heart disease are the top killers among the middle-aged. But somehow, people in the U.K. have just gotten better at surviving.